The Lobelia Socks and Forester Socks by Betty Salpekar use her unique bottom-up construction method. 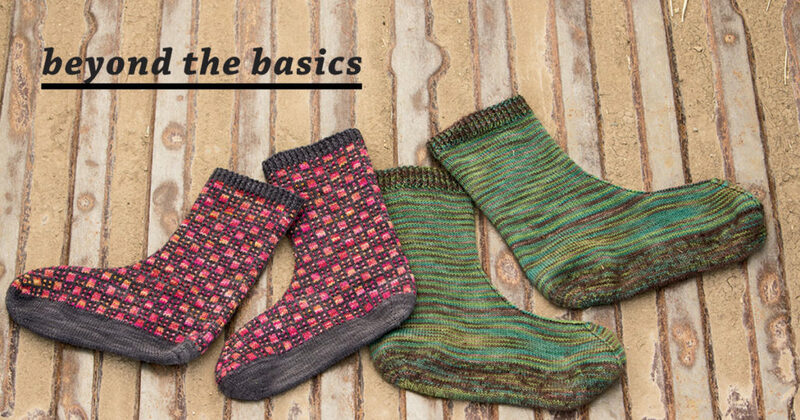 This article on solefull sock knitting was originally published in Interweave Knits Summer 2014. The Lobelia Socks (left) and the Forester Socks (right) use Betty Salpekar’s “solefull” sock method of construction. Photography by Joe Hancock Photography. Socks can be knitted in many directions—top down, toe up, sideways, obliquely, et cetera—and each has its own advantages and challenges. Solefull socks offer yet another option, another direction. I call them “solefull” because you knit the sole in full first, before any of the rest of the sock. Then you just keep knitting up in the round from the perimeter of the sole. It’s satisfyingly intuitive because your knitting progresses in exactly the way that water gently rises to cover your feet when you stand in the surf on a beach. carry along reinforcement yarn on the whole sole, not just the heel and toe. easily re-sole the socks without disturbing the sock top at all. cushion the soles by using thicker yarn for them than you use on the top. 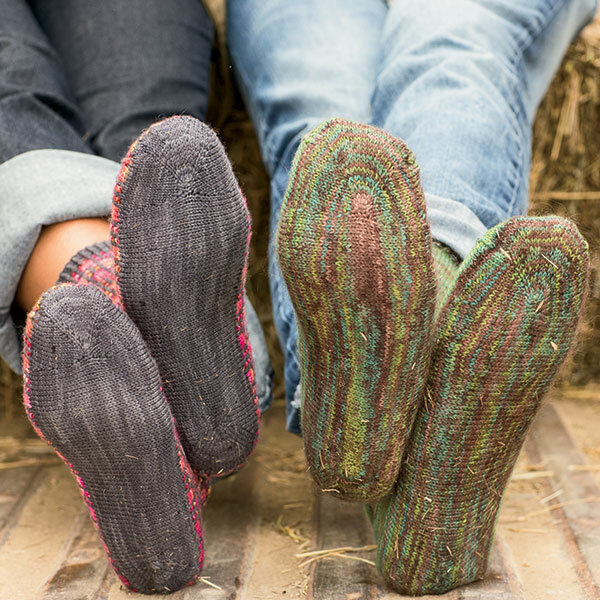 make thrifty use of leftover yarns by using them to knit soles, because soles don’t have to be the same color or even the same gauge as the rest of the sock. knit all of the sock in the round, from cast-on to bind-off, except for one or two short-rows around the sole toe. avoid picking up stitches entirely. avoid Kitchener stitch entirely (in most designs). try the socks on to check fit at any point beyond about an inch and a half above the sole. easily make footlets, slippers, or anklets by simply ending the socks at any point after you join the sides at the lower foot. let stitch patterns cover the whole top of the sock, including toes and heels. divide a questionable yarn quantity in half and know you’ll be able to make both socks the same length, long or short, by just knitting until the yarn runs out. delight in the surprising ways horizontal stripes and vertical design elements bend, arc, and merge around the toe and up the instep. My spur to developing this sock architecture was what spurs so much innovation: aggravation. I would buy those little cards of reinforcement yarn and faithfully follow the instructions to carry it along on heel flap and heel turn, then again from the beginning of the toe decreases to end of the toe. There was usually just enough yarn for that. Then came the aggravation; my socks would develop holes only at the bottom of the heel and under the ball of the foot! Right where it wasn’t practical to carry along the reinforcement yarn, even if there had been enough. It was equally frustrating to see that the back of the heel and the top of the toe, both places where the precious reinforcement yarn had been used, hardly showed any wear. They not only hadn’t worn through—they weren’t even thin. I was convinced that—on my socks, at least—those places didn’t need reinforcing. Or that they weren’t the only ones. The obvious solution was to reinforce the whole sole. That meant knitting the sole by itself before, during (by knitting the sock sideways), or after the rest of the sock. After researching existing literature (as it existed back in 2009) and a lot of experimentation, I hit upon this solefull method and haven’t used any other since. I’m still comforted by the intuitive knitting direction (from the ground up), still infatuated with the way stitch patterns transform themselves during toe, foot, and instep shaping, and still taking sensual pleasure in carrying along a thin mohair/silk blend yarn on the whole sole. Not only does that reinforce the sole, but it creates a luxuriously soft and cushiony barrier between my feet and the cold floor. BETTY SALPEKAR lives in Atlanta, Georgia. She is the author of the book Solefull Socks: Knitting from the Ground Up (Bread Crumbs Press, 2014), which is the definitive guide to her solefull sock method. Try out Betty’s solefull sock-knitting method today!